A digital only resource that supports AQA Step up to English Level Certificate levels. 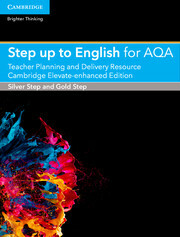 Written for the AQA Step up to English Entry Level 1, 2 and 3 Certificates for first teaching from 2015, this complete pack contains 15 engaging and active projects across three different levels, with dedicated resources for EAL learners and full planning and delivery support. Designed for maximum flexibility, teachers can pick and mix the projects to suit the timetabling of their course and needs of their learners. Full coverage of the AQA Step up to English Entry Level 1, 2 and 3 (Silver Step and Gold Step) Entry Level Certificates, with content and skills holistically integrated throughout each of the 15 projects at each level. Designed specifically for Entry Level learners, each project uses group work and active engagement to inspire students to develop a love of learning and the skills necessary to move on to GCSE. All worksheets and activities are provided in editable format so they can be tailored to the learners’ specific needs. Projects can be chosen to fit within the time available for the course, allowing for teaching within a couple of months to over a year, while still giving confidence that all content and skills have been covered. 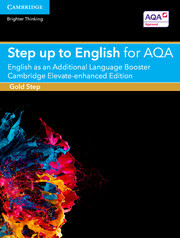 Includes dedicated support for EAL students.